If you’re wondering what this means for your business, it comes down to this – there will be no patches or security updates, putting your applications and business at risk. New threats won’t be addressed and your WS2003 systems will become a security risk and compliance nightmare. This is identical to what users experienced last year with Windows XP. The biggest challenge for many organizations won’t be upgrading the server software, but rather the applications that run on those servers. The main problem with Windows 2003 is it’s a 32-bit OS, whereas newer operating systems run 64-bit environments. This could mean compatibility problems with older, homegrown applications that will need to be updated too. Organizations might see migration as a major headache, but doing so will also bring lots of benefits. 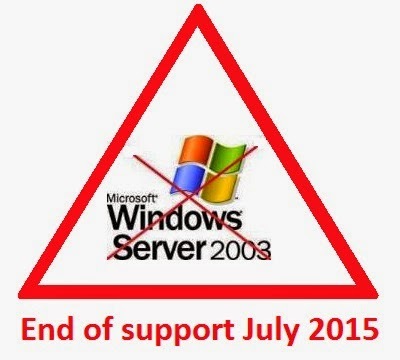 Windows Server 2003 was designed for yesterday’s IT infrastructure, and many aspects of it are now out of date. At The PC Repair Centre we can assess your current set-up & determine what you need going forward. Some companies will need a new server, some will be able to eliminate the requirement for a server, & some will unfortunately be stuck with Server 2003 until they can move on from any legacy software that they rely on.